Best wishes to all for a wonderful 2013. Did you stay up and watch the fireworks? I was at work until 9.30 last night, so it was simple to stay awake and welcome in the New Year (although to be really truthful I was reading a book with the TV in the background). As always at this time of year I reflect on the happenings of the previous one and I can only say for me it was a very full year. Lots of changes, challenges, work, pleasures and fun spent with great family and friends. 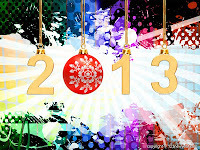 Already I've got lots of plans for 2013. First up however, I must acknowledge my wonderful partners in the Chookyblue Secret Santa Swap for 2012. I've previously posted about the Swag I made and sent to Lyn who lives in New Zealand. Lyn sent me a lovely email just before Christmas letting me know she'd opened my parcel early because she was travelling to Australia to spend Christmas with her Mum in Sydney and she loves my gift, so now I can share it here. The instructions for the Table Topper came from the book "On The Run" by Heather Mulder Peterson and seeing it display on my garden table, I'd really like to make another for myself! Sadly (because I've seen the photos) I've yet to receive my gifts from Wendy. Patience has never been one of my virtues and the postal service has let us down - I'm not happy! I had the perfect spot to hang the lovely little quilt Wendy made me - but it will look just as good in 2013, once it arrives. I know how disappointed Wendy is feeling right now - in the 2011 Swap my partner in Chile didn't receive her gift from me until February, despite me posting it in the first week of November! I actually gave up and posted a second gift although happily both did eventually turn up. My thanks, gratitude and admiration must also go to Chookyblue for arranging the swap. I can only imagine the work and time involved in coordinating the swap. I love participating - from the planning of what to make, the pressure of actually finishing the gifts to get them in the mail on time and most especially reading all the blogs of the participants (the downside of which is that I'm forever being inspired to be more creative and start more projects) (Is that really a downside???)). I do hope your gift shows up there is nothing worse than having to wait. Hi Bev, what a gorgeous table topper you made for Lyn, no wonder you want to make one for yourself!